Easy on and off for your tour-pak! All HD parts are special order. For installation of detachable tour-pak rack components on 2008 Ultra...send us an email and ask for our Special Installation Note. HD-221-14: Change your riding style in less than 60 seconds. The ultimate in touring flexibility, this Tour-Pak® Rack makes the convenience and protection of a Razor-Pak, Chopped, King, or Leather Tour-Pak® Luggage System a simple on-and-off proposition. Fits '14 to current Road King® and Street Glide models. Requires separate purchase of Docking Hardware Kit and our Audio Hidden AM/FM/WB Antenna. HD-459-14B: Similar to above but in gloss black. HD-291: Transform your Electra Glide® model for around-town cruising. 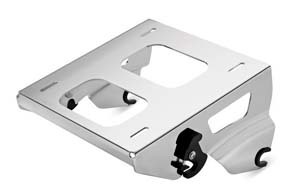 Includes everything needed to convert the rigid-mount Tour-Pak® to an easy on-and-off detachable version. 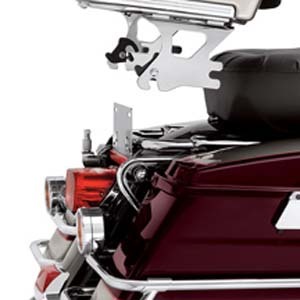 Complete kit includes Docking Hardware Kit, H-D® Detachables™ Two-Up Tour-Pak® Mounting Rack, AM/FM Antenna Relocation Kit, License Plate Relocation Kit, and Red Lens LED Turn Signal Relocation Kit. 1 year OEM limited warranty. Fits '14-later FLHTCU, FLHTCUL, FLHTK, FLHTKL, FLHTKSE, FLTRU and FLTRUSE models. 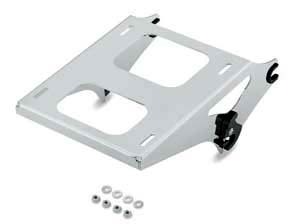 Models equipped with CB require separate purchase of CB Antenna Relocation Kit our p/n HD-308. CVO™ models require separate purchase of Lighting Module. Does not fit models equipped with Boom!™ Audio Stage II Tour-Pak® Speaker Kits. Warning: Do not use this rack as a seat. Do not exceed the fender rack weight capacity. Using as seat or exceeding this capacity could cause handling problems which could result in loss of control and death or serious injury. Disconnecting your DOT requirement brake lamp could reduce your visibility to others and result in death or serious injury. HD-246: Transform your Electra Glide Classic or Ultra Classic model for around town cruising. 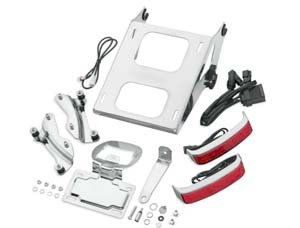 This kit includes everything needed to convert the rigid-mount Tour-Pak® to an easy on-and-off detachable version. In just seconds (and without tools), you can install the Tour-Pak® for that long run across the country, and remove it for a stripped-down look when you get there. It also makes it possible to install a detachable Sissy Bar Upright and passenger backrest pad for around-town passenger comfort. Complete kit includes two-up docking hardware kit, detachable Two-Up Tour-Pak® Rack, chrome strut covers, chrome license plate holder, reflector, and AM/FM antenna relocation hardware. Fits '09-'13 FLHTC, FLHTCU, FLHTK and FLTRU models. FLHTCU and FLHTK require separate purchase of Wiring Harness P/N HD-032. FLTRU models require separate purchase of Wiring Harness HD-692. 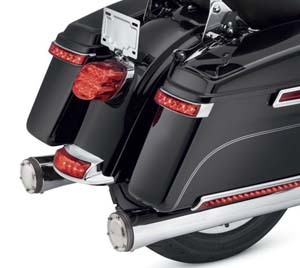 HD-303: Transform your Electra Glide® Classic model for around town cruising. This kit includes everything needed to convert the rigid-mount Tour-Pak® to an easy on-and-off detachable version. In just seconds (and without tools), you can install the Tour-Pak® for that long run across the country, and remove it for a stripped-down look when you get there. Includes the Docking Hardware Kit. You can install a detachable Sissy Bar Upright and passenger backrest pad for around-town passenger comfort. 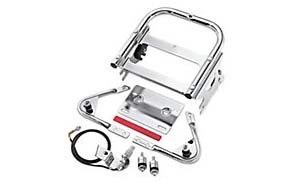 Complete kit includes two-up docking hardware kit, detachable two-up Tour-Pak® Rack, chrome license plate holder, reflector, and AM/FM antenna relocation hardware. Fits '06-'08 FLHTC models. HD-303B: Same as above for MY '97 to '05 and also includes required Light Harness Kit. HD-276 Line: Change your riding style in less than 60 seconds. The ultimate in touring flexibility, this Tour-Pak® Rack makes the convenience and protection of a Chopped, King, or Leather Tour-Pak® Luggage System a simple on-and-off proposition. 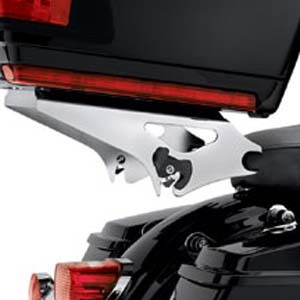 Simple turn latches mount the rack to the bike's docking points, and allow you to replace the Tour-Pak® with a detachable sissy bar upright for around-town cruising. 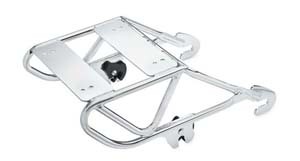 The chrome-plated Detachable Rack positions a Tour-Pak® behind the passenger pillion, and allows the passenger to use the luggage as a supporting backrest. Adjustable over a 3/4" range, the Tour-Pak® can be located for maximum passenger room and comfort. Tour-Pak®, Passenger Backrest Pad, and Docking Hardware Kit sold seperately. 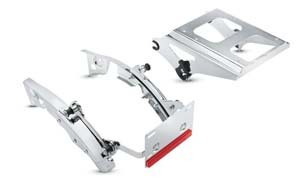 HD-276-9: Fits '09-'13 FLHR, FLHRC, FLHT, FLHX, FLTR, FLTRX, FLHXSE and FLTRSE3 models. Requires separate purchase of 4-Point Docking Hardware Kit. FLHX, FLTR and FLTRSE3 models require separate purchase of Tour-Pak® Ant. Special order item. 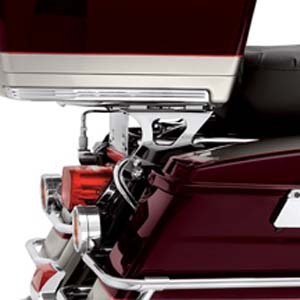 HD-276-4: Fits '97-'08 Road King®, FLHT, FLHX and FLTR models equipped with required docking hardware. FLTR and FLHX models require Antenna Relocation Kit P/N HD-326. 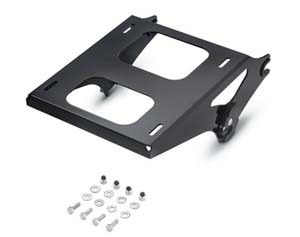 Does not fit with Layback License Plate Mounting Kit. Special order item. HD-TT-RACK: Fits ’92-’93 FLHS, ’94-later FLHR, FLHT. Also works with FLHRC Leather Tour-Pak. FLTR models require Antenna Relocation Kit. Does not fit with Chrome License Plate Light Kit. 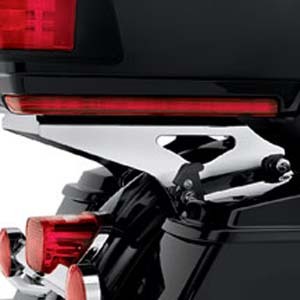 Does not fit with Visor-style Decorative Taillight Kit. Note: Requires separate purchase of Docking Hardware Kit (HD-127, rear) and (HD-104, front). 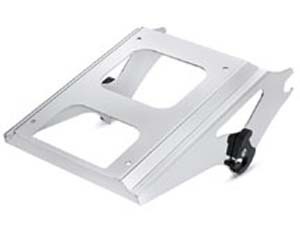 HD-225-14: The Solo Tour-Pak® Rack moves a Chopped or King Tour-Pak® forward to a comfortable back supporting position. 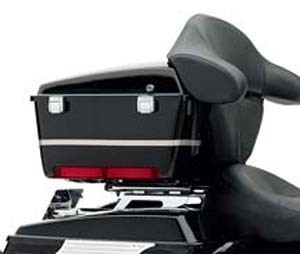 Fits '14 Road King® and Street Glide® and up models equipped with a solo seat. Requires separate purchase of Docking Hardware Kit and Audio Hidden AM/FM/WB Antenna. HD-260 Solo Tour-pak Racks: The Solo Tour-Pak® Rack moves a Chopped or King Tour-Pak® forward to a comfortable back supporting position. 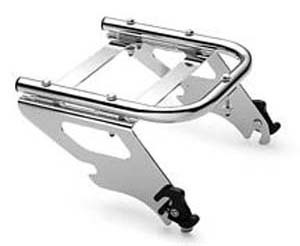 The rack is designed to position the Tour-Pak® for solo riding and is adjustable over a 3/4" range. Simply remove the Tour-Pak® from the convenient detachable hardware, add a passenger pillion, and the bike is ready for two-up riding. Tour-Pak®, Passenger Backrest Pad and Docking Hardware sold separately. 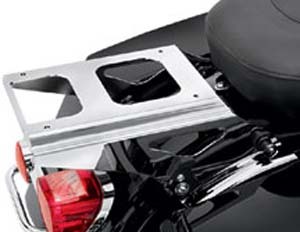 HD-260-2: Fits '97-'08 Road King®, FLHT, FLHX, and FLTR models equipped with solo seat and required docking hardware. 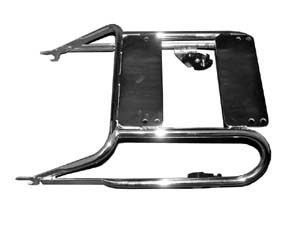 HD-260-9: Fits '09-'13 FLHR, FLHRC, FLHT, FLHX, FLTR, FLTRX, FLHXSE and FLTRSE3 models equipped with a solo seat. Requires separate purchase of 2-Point or 4-Point Docking Hardware Kit. FLHX, FLHXSE, FLTR and FLTRSE3 models require separate purchase of Tour-Pak® Antenna Relocation Kit. HD-051-8: Two up rack designed to be installed and removed in less than 60 seconds, this Tour-Pak® Rack makes the ultimate accessory in touring flexibility. Easy on/off convenience. Requires separate purchase of appropriate Docking Hardware. Fits '06-later FXST, FXSTB, FXSTS, FLSTFSE2 and '07-later FXSTC, FXSTSSE/2, FLSTF, FLSTFB and FLSTSB models. Designed to accept Leather Tour-Pak® Luggage. Does not fit with Sport Tour-Pak® Luggage. 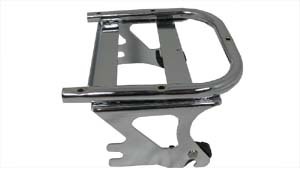 FXSTC models require removal of Original Equipment and separate purchase of appropriate docking hardware kit. HD-559-4: Install a trunk in a comfortable back supporting position. 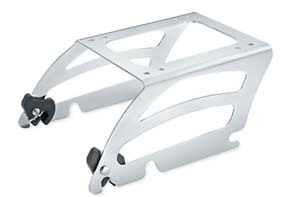 The rack is designed to position for solo riding and is adjustable over a 3/4" range. Remove from the convenient detachable hardware, add a passenger pillion, and the bike is ready for two-up riding. Trunk passenger backrest pad and docking hardware sold separately. Requires separate purchase of appropriate Docking Hardware. Fits '00-'05 Softail® models (except FXSTD). Fits '06 FLST, FLSTF and '06-later FLSTC, FLSTN, FLSTSC models. Some models require a separate purchase of Direction Relocation Kit. Some EU registration plates may interfere with Rack. 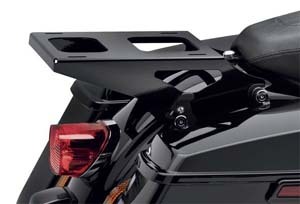 Models with rear fender tip trim can be adapted with the separate purchase of License Plate Relocation kit.